There's still time to participate in Color Challenge 62! Remember, you don't have to have the EXACT colors to play - just use colors inspired by the ones you see below. This challenge features cool colors to inspire you — Gravel Gray, Blueberry, Spearmint, and Tropical Teal. Once you've created your card, you can add it to the InLinkz located HERE. You could win a gift card to the My Favorite Things online store worth up to $20 - what more motivation do you need? 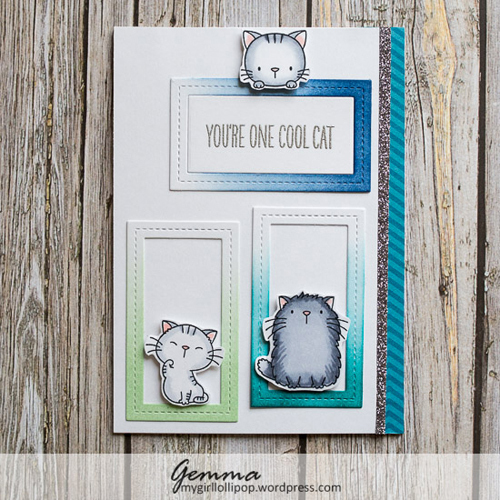 Gemma's look features three cool cats framed by stitched ombre elements that were created with the Stitched Rectangle Frames Die-namics. Each frame is representative of one of the challenge colors while the glittered strip brings in the fourth! 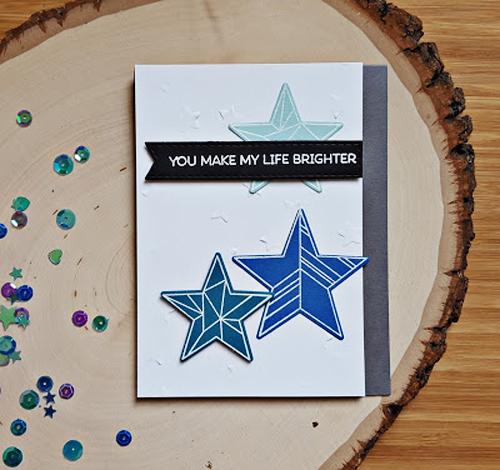 Rosemary's card shines with a trio of elements created with Stars Above and a simple gray strip down the right edge. Placing her sentiment on a flag element helps it stand out against the rest of her design. Both Gemma and Rosemary have doubled the fun by combining last week's Sketch Challenge with our latest Color Challenge. Not only do you get to enter both challenges with one fun project, you have the added benefit of enhancing your creativity by figuring out how to integrate the challenges into one cohesive look. Why not give it a try yourself? Sketch Challenge 318 just went up yesterday - you have plenty of time to combine it with Color Challenge 62! We can't wait for you to share so get busy. These are DARLING cards, especially the cool cat one!!! !